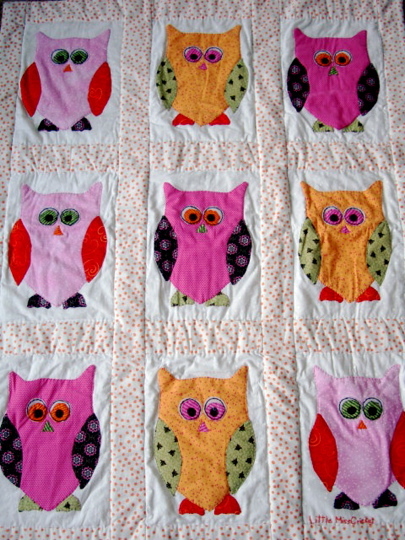 Little did I know that when I asked my mother to help me sew on the owls to my tablecloth, thinking it was such a great idea that I came up with, she had already hand sewn many owls on this fantastic quilt she made for her granddaughter. It's a quilted replica of the shower invitation! I think it's pretty funny that 3000 miles away from each other our two similar but separate owl projects were started. I guess the apple doesn't fall far from the tree! We'll keep you up to date, and in the know.